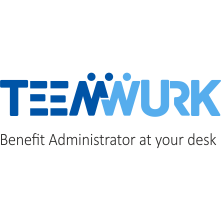 TeemWurk is an ace technology and service provider that offers a collaborative suite of integrated services including HR solutions, Employee Benefits Enrollment & Administration, Payroll and 3D EDI tool. TeemWurk is a leader when it comes to Benefits Enrollments and Administration as it facilitates the enrollments through the SaaS based applictaion. * We monitor all TeemWurk reviews to prevent fraudulent reviews and keep review quality high. We do not post reviews by company employees or direct competitors. Validated reviews require the user to submit a screenshot of the product containing their user ID, in order to verify a user is an actual user of the product. Hi there! Are you looking to implement a solution like TeemWurk?